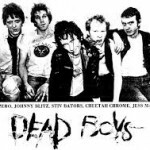 I was watching videos of the “Dead Boys” from the 1970s in the Fales Collection at Bobst Library. And some of my research has paid off, I think. They’re in a key scene in The Flood is a Flawless Mirror for the Sky, the novel I’m working on.